Applying a Hay & Straw Cap to a bale is easy and can be done in under one minute. Always remember to apply your Hay & Straw Caps at Ground Level. 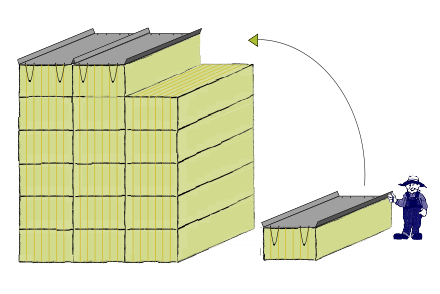 Ensure the Hay & Straw Cap is placed squarely in line with the bale, making sure both folding edges are facing upwards and both equally overhang at each end. Take hold of two of the strings at one end and securely fix into place with plastic anchors. Ensure the plastic anchors are angled upwards into the bale so that the anchor can be securely fixed onto the rope when placed into the bale. Repeat this on the other end of the bale. Once both sides of the Hay Cap have been securely tied down the bale is now ready to be stacked in position on top of the stack. Make sure the bale with the Cap sits on the bale below and then push the bales together to make the Caps sit inline. For extra strength during high wind conditions, on the bale at the end of the stack; tie a rope around the bale and cap before pushing the bale together. In order to preserve the lifespan, stack all Caps neatly aligned staggering the ends to protect the folds. Tie 20 anchors together using a 2 metre long rope or bailing twine. Place 2 strings of anchors (40 anchors) on top of every 10th cover. This will give the stack stability and it will also help you easily organise your anchors. Repeat process as necessary.